I have sky-high expectations. Which means I set almost impossible-to-reach goals. I’d like to say it’s because I believe that if you shoot for the moon at the very least you’ll land among the stars, but to be honest it’s because I always think I can get more done in a day than is humanly possible. Some days I miraculously manage to get all of The Things completed. A tool I use to keep myself focused, inspired and on track are accountability partners. Every weekday I send off a quick email to my partners listing my goals for the day. More than once my over zealous fingers have made me giggle by typing the word “gaols” instead of “goals”. There are definitely days when “gaol” – the outdated spelling for the word “jail” – is way more fitting. When you are motivated by checking off boxes on a long to-do list it’s easy to slip into the mindset of Just Get The Damn Thing Done. Suddenly none of the tasks are enjoyable. Doing them out of a sense of duty turns your goals into a punishment where you’re acting out a self-imposed sentence of community service. I seem to find myself in Goal Jail more often at the end of a year. Maybe you do, too. It’s common to focus on the unreached goals and drive yourself to madness trying to get it all finished, rather than celebrate all the awesome stuff you actually did get done. In order to avoid being imprisoned by my goals, I’ve made a couple of adjustments to my work pattern that have kept me on-track while still being insanely productive. I take 30 minutes and create a week of daily to-do lists at the beginning of the week and take care to spread tasks evenly over seven days. This helps avoid the sense of overwhelm that can come when you lump all of your weekly tasks onto one long list. I keep Friday afternoons open for “unfinished tasks, M-Th”. This way, when I have tasks I don’t get to in a day, I don’t freak out because I know I’ve made space and time to revisit them later in the week. Now’s the time to renegotiate expectations: Does this task have to be done this week? This month? This year? At all? Depending on the answers I’ll defer the task to a more appropriate section of my annual plan. On some occasions, I’ll even dump the task. As the end of this year approaches I’ve been negotiating hard: Do I have to log more creating hours (I’ve already surpassed my annual goal by 70 hrs)? Do I have to push to update my website NOW? Do I have to apply to every call for submission I come across? The answer to all these inquiries is a simple, “no”. My intention for the precious few workdays left this year is to prioritize, stay present, and let go of a few unfinished tasks and the guilt that comes from not doing them. How much more really needs to happen in your life before December 31st? 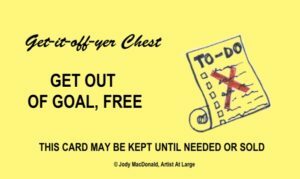 You have my blessing to use the Get Out of Goal, Free card. Fab post. I love that: Goal Gaol/Jail – ain’t that the truth sometimes. The more I overload my schedule, the less I enjoy my work. Thanks for reading, Alison – I’m glad the post connected with you. I find I need constant reminders to not schedule too much into a day (week, year).